Chevre and Onion Tart ‚ order it at Le Cafe Cent Dix, eat it and die happy. My husband and I have been on a very strict diet: No dairy, no red meat, no processed foods, few carbs, no gluten, white potatoes, rice, pasta, … no fun. We fought over the warm slice of goat cheese and caramelized onion goodness in a buttery crust. Served with Bibb Lettuce, lightly dressed, and some roasted Beets, for an amazing start. 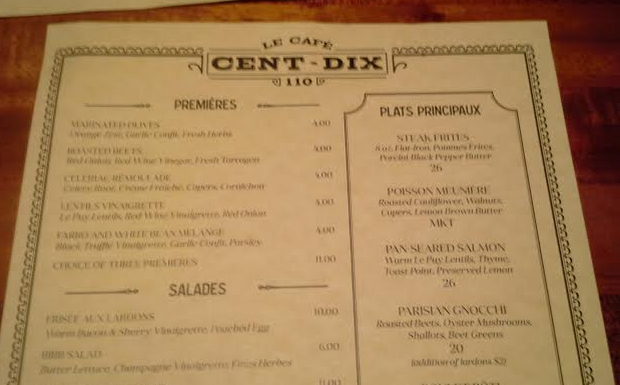 The Cafe menu with “Premieres, Hors D ‘oeuvres, Plats Principaux, makes for interesting reading. Turn it over for: Les Vins Et Boissons and it gets richer. Next course: Steak Frites, Oysters Pernod, both rich and flavorful — especially the garlic aioli for the fries, greatly appreciated for the forbidden tastes, but not wow. 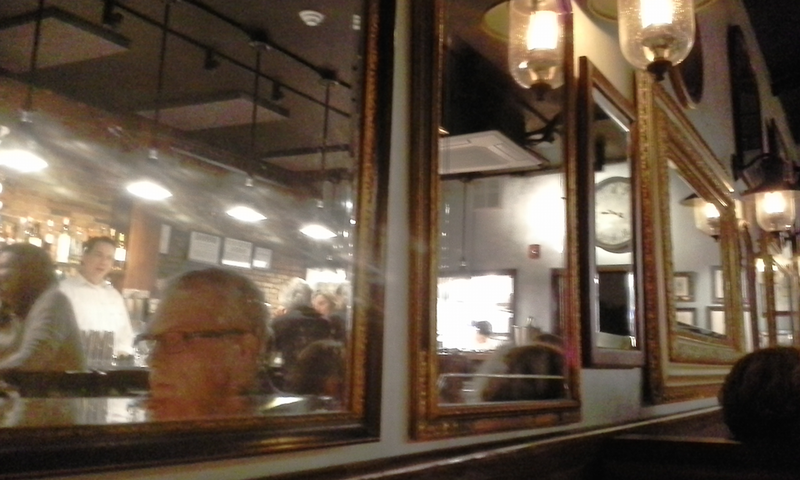 The Cafe is warm and friendly, lots of mirrors, long bar generous booths, attentive service, except the Bordeaux, which arrived late and was comped. 110 North Aurora Street, Downtown Ithaca. Entry filed under: french cuisine. Tags: Ithaca New York, Restaurants.